Editor's Note: Tenzin Dorjee is executive director of Students for a Free Tibet, a global grassroots network of students and activists working for Tibetan independence. A writer and an activist, he is a spokesperson for the global Tibetan youth movement. (CNN)–In a crass display of moral blindsight, Stephen Prothero's blog post on Tibetan self-immolations blames the victim instead of the bully. Tibetans are stuck in one of the world's last remaining and most brutal colonial occupations. It is through this lens, more than anything else, that we must understand the self-immolations. Since 2009, at least 44 Tibetans -– monks, nuns and lay people -– have set themselves on fire to protest China's rule; 39 self-immolations have occurred this year alone. Every one of these acts is a direct result of China's systematic assault on the Tibetan people's way of life, their movements, their speech, their religion, and their identity. Instead of responding to China's oppression with revenge –- a path far more tempting to the basic human instinct -– Tibetans have chosen a means far more peaceful. Without harming a single Chinese, they set aflame their own bodies to shine a light upon the atrocity taking place in their homeland. They sacrifice their own lives not in the name of “God” or “Buddha,” as Mr. Prothero so dismissively suggests, but in an altruistic intention of alerting the world to their people's suffering. By demanding that the Dalai Lama condemn these individuals who have shown compassion beyond our imagination, Mr. Prothero has betrayed a colossal indifference to the courage and circumstances of those fighting for the same democratic freedoms and human rights that he himself enjoys. How can the Dalai Lama condemn the self-immolators when their motivation was evidently selfless and their tactic nonviolent? Would we ask Gandhi to condemn activists in the Indian freedom struggle who were killed while lying on the road to block British police trucks? Or the hunger strikers who were starving themselves to death in order to protest the injustices of British rule in India? By every measure, it's the Chinese leaders and not the Dalai Lama who are responsible for the self-immolations in Tibet. They have the power to ease tensions, reverse restrictions, and stop the self-immolations overnight. But instead of seeking a lasting solution to the Tibet issue, they continue to aggravate the situation by intensifying the repression. No one is more tormented by the self-immolations than the Dalai Lama, whose bond with the Tibetan people goes deeper than language can express. In fact, it is the singular calming influence of the Dalai Lama that has kept the movement nonviolent to date. As a universal icon of peace, the Dalai Lama's spiritual influence goes well beyond the Buddhist world. Nevertheless, his moral authority is not an infinite resource. There is an invisible moral rope with which the Dalai Lama has bound the Tibetans to nonviolence for four decades. But this rope is wearing thin as China's escalating tyranny drives Tibetans into a corner. Self-immolation, which emerged as a tactic from being cornered for too long, represents the final outpost in the spectrum of nonviolent resistance. If this last remaining space for expression, no matter how drastic, is taken away, the rope might just snap. Chaos will ensue, vastly increasing the chances of a full-blown ethnic conflict that even the Dalai Lama will have exhausted his moral capital to stop. From all of Mr. Prothero's accusations, the most offensive is his comparison of self-immolations to sati – a social system in ancient India where widows were pressured to throw themselves into the funeral pyre of their deceased husbands. Self-immolation – a political act of reason – is the polar opposite of sati – a blind act of superstition. There is not a single case of Tibetan self-immolation that was prompted by social pressure or religious obligation. Every incident of it, unexpected as it is, shakes the nation, the community, not to mention the family, to its foundations. Every Tibetan prays in his or her heart that the latest might be the last. The image of a person engulfed in flames is shocking, often disturbing, to people living in the free world. For all our obsession with violent movies, graphic video games, and live coverage of wars, it still rips our hearts to pieces when we see a human in flames. Rather than indulging in philosophical investigations into the morality of self-immolations, we must see these actions for what they are: urgent pleas for help from a people pushed to the brink by decades of ruthless repression. One hopes that most people are focused on the real question at hand: how shall we answer this call? The opinions expressed in this commentary are solely those of Tenzin Dorjee. Buddhist doctrine is against killing living being, especially human being. Buddhist (including Tibetan Buddhist) believes in Nirvana (heaven) and Naraka (hell) right ? Those who incites self-burning, those who self-burn themselves and those who support self-burning will definitely go to hell according to Buddhist doctrine ! These self-burnings are nothing but a form of terrorism; the same as muslim terrorism condemned in the whole world, especially by the-self-calling police of the world; the united states and its western allies. What a hypocrisy that united states and its western allies condemn islamist terrorism but support these self-burnings and other China-bashing means; by funding the Tbetan dissident groups and using it as political tool to divide China ! Last time US publish human rights report which of course did not include US own human right record and China fight back by publishing human rights record backed by non-China data. China can strike back by supporting dissident groups who are against US and western countries – let's see. Those who incite Tibetans (especially youngsters) to burn themselves are really disgusting. They are not different from those who incite muslims to commit terrorism. They use religious cover to hide their political agenda. Whether the Self-Immolation is non-violence is very hard question because it depends fully on the motivation of oneself (self-immolator). When one immolates for others happiness and freedom then it hardly is violence in a broader way but it seems to me that its violent for the oneself(this is my opinion). Tenzin, You wtote a beautiful and eye opening facts regarding Tibet and Tibetans. I hope people of word will understand the true meanintg of great sacrifices made by these brave Tibetan indivituals.– The key point here is not a single person was harmed by their actions. Everyone here agree that it is not an easy for anyone's decission to offer themselves for others wellbeing. This caurages act shows how desperate they to get their opinions heard. I hope Chienese Government will understand Tibetan sentiments and value their beautiful culture and honor their basic HUMAN RIGHTS sooner than later. May Peace Previl In this World. This is not different from those who incite muslim youngsters to commit terrorism. Those who are behind it using religious cover to hide their political agenda. Sacrifice ? That's not what I called sacrifice; those are people who got hoodwinked into doing self-burning which is not only against Buddhist doctrine, but also against human lives. I don't have any trouble supporting and sympathizing with those who have chosen self emulation as a way of protest. In fact I expect it to inevitably come more and more to the shores of the U.S. as well considering this country's karma but I do have enormous trouble with spouses and parents and especially teenagers finding the need to have their lives cut short because of what ever kind of oppression they find themselves surrounded by. Especially considering that virtually no matter where you find yourself living in the World oligarchy you will find yourself surrounded by oppression if you just open your eyes to it. But the simple truth is that the young have a right to live as long and as happy as they can possibly can. And parents do not yet have the right to die leaving their children with yet more sadness and agony to endure. But in my opinion, the old and aging, and I say this as I am approaching my own 70th birthday, have by virtue of having already had their chance at living in this realm for a considerable amount of time the ONLY right to engage in this kind of protest. The Dalai Lama teaches that to bring peace to the world we must first cultivate it in ourselves. Hatred, ridicule, and harm to others have no place in the cultivation of inner peace. The Chinese oppression of the Tibetan people is no longer tolerable for those who have self-immolated. They have not brought harm to others as they have made the plea to the rest of the world to take notice of oppression and genocide of the Tibetan people and destruction of their monasteries and culture. Just as the world has had to come to terms with the Holocaust in Germany, the world will have to come to terms with the holocaust in Tibet. In the human history, the 14th Dalai Lama is a rare soul. Today, the Dalai Lama is a global icon: respected, revered and looked up to by people all over the world for his great moral authority, for his tireless work and teachings on world peace, compassion and harmony among the different religious faiths in today's world. The Dalai Lama message is very simple yet very powerful in today's troubled world. His message is consistent: always the same. Now coming to Stephen Prothero's blog on the self-immolations by the brave and courageous freedom fighters in occupied Tiibet and his demand that the Dalai Lama condemn the brave Tibetan self-immolaters. Excuse us(Tibetans) , Mr. so called blogger Stephen Prothero, how can the Dalai Lama condemn the brave freedom loving Tibetan self-immolaters ln occupied Tibet. Not a single self-immolaters: some of them were teenagers, some were monks & nuns and some everyday folks with kids and family, had NOT resorted to any forms of voilence NOR harmed anyone. All of them made the ultimate and the supreme sacrifices of their precious lives for freedom and human diginity in Tibet. Their common demand is freedom in occupied Tibet and the return of His Holiness the Dalai Lama to Tibet. Majority of the 44 self-immolaters were born after 1959, the year communist China invaded and illegally occupied Tibet. Even after well over 50 plus years of Chinese communist rule ln Tibet, the Chinese rule has utterly and miserably failed to win the hearts and the minds of the Tibetan people. This clearly shows that China's repressive Tibet policy and treatment of Tibetans is a huge failure. Mr. blogger Stephen Prothero, before blogging about the brave and courageous Tibetan self-immolaters, get your facts right and please don't add salt to wounded Tibet.The practice of sati in ancient India and self-immolations by Tibetans in occupied Tibet under the presen dayt repressive and draconian Chinese communist rule are totally totally different for your information. Please have some respect and show some compassion and human dignity to the souls of the brave and courageous 44 self-immolaters from the roof of the world. Maybe Dalai Lama is your god, but please don't make it sound like he should my god as well. Maybe he is a nice guy, but he has no business telling me what to do. There is a lot more to being a leader than schmoozing with movie stars and celebrities. In fact I find it repulsive that someone could claim to be born as a living god. If he wants to be a real leader, get in line and climb the political ladder like any other politician does. Just because he can give a theoretical lecture doesn't mean he can make good policies and solve real people's problems. As for Tibet, Chinese people should bide their time. Just remember back in the days it took several centuries for Europeans to fully settle in America. As usual, the media coverage of Tibet is one-sided and unfair. No one wants to mention how depressive Tibet was when Dalai Lama was ruling it, nor do they want to know how Dalai Lama's version of autonomy would NEVER be acceptable for any past, current, or future Chinese leadership. 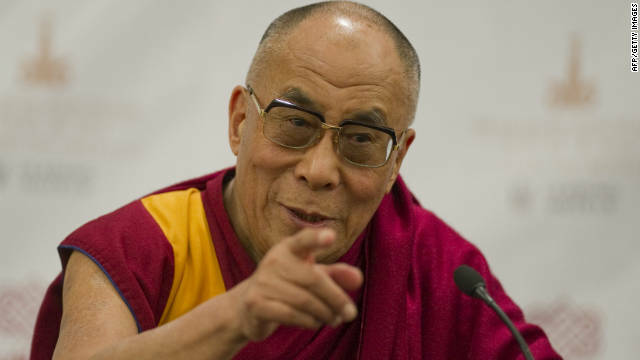 Dalai Lama has no support in China, Tibetan separatism has no support in China. Please stop pretending that a majority of the Chinese people is against their government on this issue. China is a sovereign country, it should not let other tell it what to do. alechle, ask yourself one question, why does the Chinese government censor information on Tibet to its own Chinese citizens? What is it hiding? What will happen when the Chinese people know the truth about the oppression of Tibetans? Every country has some form of media bias, same here in USA. That's why you never hear anyone mention that Tibet was a feudal society with massive number of people as slaves when Dalai Lama was ruling it in the 1950's. I have seen both side of the debate on Tibet, and I'm not impressed by Dalai Lama. I find it outrageous that people would obstruct the development of Tibet in the name of cultural preservation. Tibet will experience some pains during its development, just as other parts of China. Some people will make it an ethnic or cultural issue, but the Chinese government will rightfully not allow that to happen. Historically China wasn't a pleasant place to live if not depressive by then, most probably worse than tibet under dalai lama. Though the last point you made was interesting that is ultimately Chinese people should decide what to do with China so do tibetans should let free to decide for themselves. Don't you think it isn't fair enough? The mass media in US and western countries still dominates the world. Since the political agenda of those dissident Tibetan groups (and other dissidents as well) match US and its western allies', why should one wonder how the mass media is manipulated to bash and attack China !? I pray that the Tibetan people will one day be free of red China and its abuses. The United States and other countries will one day understand the devastation the Tibetan people have to endure, but by then it will be too late. The red Chinese want to rule the world......are we going to sit back and let it happen?????? Last I checked, it's USA sending troops to multiple countries and overthrowing governments, yet it's China that's trying to take over the world? That's nuts! So what about the hundreds of thousands of people killed in Iraq, Afghanistan and Libya. What about their suffering? Before pointing a finger at someone else, look in the mirror first. Red china !? That sounds like someone with a cold-war mentality. US has military bases around the world, invade countries for whatsoever reasons and you said China wants to rule the world ? Who in reality wants to rule the world !??? GET REAL ! I read Stephen Prothero's piece and I immediately reacted in an emotionally and angry way. I was all prepared to write a nasty comment on his article when i came across ur response. Such a well articulated piece. Its clear, logical, honest and you presented your response with such a deep and clear understanding of both the religious and political sentiments of the Tibetan people, i am really proud to be a part of this younger generation of Tibetans who can express and respond to people who misunderstand our culture, tradition and religion and convey wrong messages to people who are not aware of the current situations inside Tibet and in exile. Thank you Tendor la. Thu-je-che (thank you in Tibetan) Tenzin Dorjee for such a well written article, and for bringing more awareness on the Tibet-China issue. To all those who commented harshly, please think about this whole issue again. The Tibetan folk have been taught to be peaceful and they don't even encourage killing ants or animals for food. Buddhism is part of an age old culture and so are its values. Tibetans don't believe in harming others, and yet, they are the most cruelly treated. What choices do they have? Human change, our brain chemicals compositions change. Dalai Lama and his Tibetan overseas supporters, like (former) Shah Iran, (former) King of Bulgaria, (former) Tsar of Russia, Saddam Husein are simply out dated. Minority ethnic groups are allowed to have children more as compared to Han group. Minority ethnic groups' cuisines and other cultural heritage brings lots of tourism money to China; why would the Chinese authorities want to suppress them !? What the Chinese authorities suppress are those who incites unrest; including self-burnings. Are you saying that authorities in US and other countries not doing the same thing !????? Have you ever bother watching CCTV ? Do you know many many times CCTV display ads featuring minority groups !? ?